We're finally at the point when I could no longer readily source Battletech books here in Manila and thus my knowledge of the events beyond a certain point in the narrative history falls short. We're well past covering books released well before I started reading and we've filled in the gaps between the books that I did cover. This is the beginning of the end - the special "Twilight of the Clans" series of novels that was set to change the face of the Inner Sphere forever. 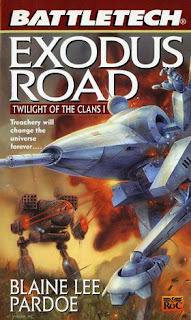 And we started with Battletech: Exodus Road, which lays the essential groundwork for the rest of this larger narrative. The Truce of Tukayyid that promised to hold the Clans back for at least 15 years was such a limited peace and one that would have to come to an end sooner or later. And as exciting as it was to read about the Clan Invasion itself, what was more intriguing was what was going to happen next once the Truce had ended. Would the invasion begin anew with the Inner Sphere largely helpless to resist the superior military training and equipment that had given the Clans at edge from the very start? Or were the 15 years enough time to prepare a serious counter strategy? Synopsis: Battletech: Exodus Road was written by Blaine Lee Pardoe and is the first book in the "Twilight of the Clans" series. The book's focus is with Clan Smoke Jaguar instead of the Inner Sphere forces. Our story focuses on Trent, warrior of Clan Smoke Jaguar who fought valiantly at Tukkayid only to be severely injured while trying to aid fellow Smoke Jaguar warriors leave the field of combat. This marked the beginning of a series of betrayals of Clan ideals that left Trent the victim of much political maneuvering by other members of his Clan. But he stuck to core principles and beliefs of the Clans despite all that had been done to him. Through all this he is largely accompanied by his bondsman, Judith Faber of the Com Guards who had fought at Tukkayid. She is demoted to the role of a tech with little chance of becoming a warrior again given the prevalent beliefs within Clan Smoke Jaguar. But this matters little to her as she is more than just another skilled warrior working in service to ComStar. She has a larger mission beyond the Battle of Tukkayid and Trent may be the key to succeeding in her mission. What I Liked: I highly appreciate how this book really focused on the odd politics within some of the Clans and how their maneuvering felt like a serious break from the values and principles they claimed to follow. We had seen a lot of it in the stories involving Clans Wolf and Jade Falcon along with the Smoke Jaguars as well. This book finally has a warrior standing against these abuses in a most unorthodox way. And there is a degree of excitement to considering how the Inner Sphere might find a way to stop a new invasion by the Clans - a question that this book begins to answer despite being set within Clan Smoke Jaguar. It was a bit of tricky narrative plotting to get to this point, I'm sure. And I totally appreciate what this book had to accomplish given the larger plans for this series. What Could Have Been Better: The relationship between Trent and Judith is an odd one that I feel should not have developed as it did. I can appreciate Trent's respect for her as a warrior, hence why he had taken her as a bondsman in the first place. But the evolution of their interactions and their relationship just felt a little contrived to me. But hey these things happen, I suppose. There's also the somewhat silly degree that Trent was abused by various members of his Clan. Seriously, I know we often paint Clan Smoke Jaguar as the "bad guys" as they were always a strong Crusader Clana and the ones who pretty much led the charge into the Inner Sphere. But the abuses Trent experienced were kind of crazy, even for a warrior supposedly disgraced by surviving Tukkayid. How does this Clan even function with the devious and short-sighted personalities holding key positions in their hierarchy? TL;DR: Battletech: Exodus Road is a well-crafted book that is essential reading to set the stage for this big narrative arc for the Battletech universe. There's a bit more drama and intrigue than you'd expect for a Clan-centric book, but it all makes sense in the end. Thus the book gets a good 4 Trials that Trent ends up failing for one reason or another out of a possible 5.